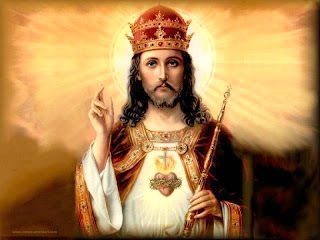 Today the Church celebrates the end of the liturgical year with the feast of Christ the King. I thought it appropriate to highlight my series on Jesus and the Restoration of the Davidic Kingdom. I also, once again, highly recommend Scott Hahn's article, “Kingdom and Church in Luke-Acts: From Davidic Christology to Kingdom Ecclesiology,” in Reading Luke: Interpretation, Reflections, Formation Scripture and Hermeneutics Series VI; eds., Craig Bartholomew, Joel Green, Anthony Thiselton (Grand Rapids, MI: Zondervan, 2005), pp. 294-326. How come Jesus only gets a double crown but the Pope gets a triple crown? Humanity and Divinity? Son of David, Son of God?